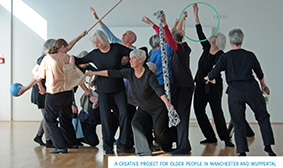 CONNECTIONS is a creative music and dance partnerhsip project across Europe that works with two separate groups of older people in Manchester, UK and Wuppertal, Germany. The group in Manchester will work with a composer and members of the orchestra over a period of eight creative workshop sessions to compose a brand new piece of music based on the theme of connections; connections to place, to people, to the next generations, to community, to culture, to nature etc. Their new piece will be approximately 12 minutes in duration and created and orchestrated by the group themselves alongside the composer and musician, who will realise their ideas in notation. The piece will then be rehearsed and recorded by a mixed instrument ensemble of ten Manchester Camerata musicians with our Music Director Gabor Takacs-Nagy at Blueprint Studios in Manchester. This sets the older participant into the artist role of composer; creating new music and taking part in the rehearsal and recording process with professional musicians. For composers and composition students alike this is a rare opportunity. The recording will then be sent to Germany for Barbara Cleff to use as the stimulus for a new piece of dance with Tanztheater fur Menschen ab 55 at the Adult Education Centre Wuppertal. The new coreography will then be premiered at the next Long Live Arts conference (tbc) in Brussels in April 2016. Two members of the Manchester group will travel to the conference in Brussels to present the process behind their composition, their experiences of becoming composers and artists in the third age. The recording will also be made available on Manchester Camerata’s website and has the potential to be used as a pre-concert presentation within the concert series in Manchester.